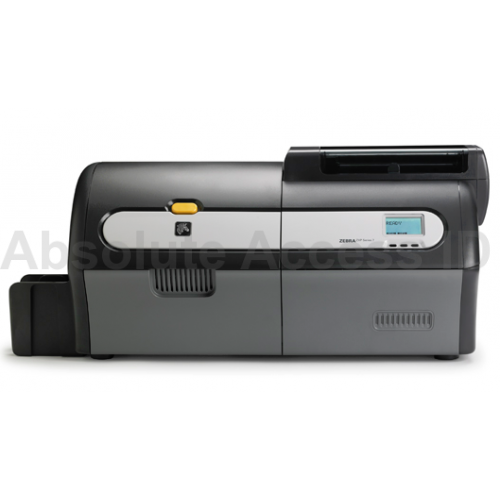 The Zebra ZXP Series 7 ID card printer is a dual sided card printer ideal for high volume and high performance printing. The Series 7 card printer automatically adjusts to the thickness of a card while ribbon loading is simple and easy. This printer also offers color coded guides with a clear LCD control panel making it easy for anyone to use. The printer comes with USB and Ethernet connectivity, US power cord. The ZXP Series 7 is a card printer which works out of the box in a variety of environments and applications while offering high speed color and monochrome direct to card printing. High capacity ribbons minimize ribbon changes while rendering low cost per card printing.